Before Christmas, Jade from T Plus contacted us about reviewing some of their green teas. They kindly allowed us to choose 2 boxes of tea which were gifted to us. 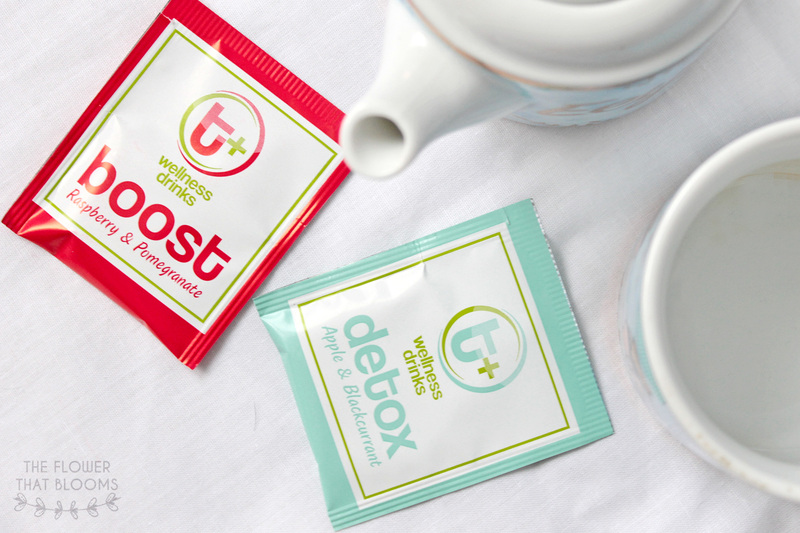 As it’s a new year and we need a little extra boost, we chose the Boost and Detox teas. Since they contain herbs and fruits, we were interested to see if they tasted any different to the normal types of green teas we drink. We’d just like to say that although we were gifted these teas, our opinions are our own and we will be honest with our review. Firstly, to us packaging is a big deal so when we saw how professional looking the teas were, we were seriously impressed! From the boxes, to the little packets and even the tea bags themselves, the packaging design is quirky yet professional. Each of the 4 available teas on their website have a different colour scheme which relates to the ingredients/flavour of the tea. When making the tea, the box suggests you brew the tea bags for 3 minutes to get the maximum flavour so this is what we tried. 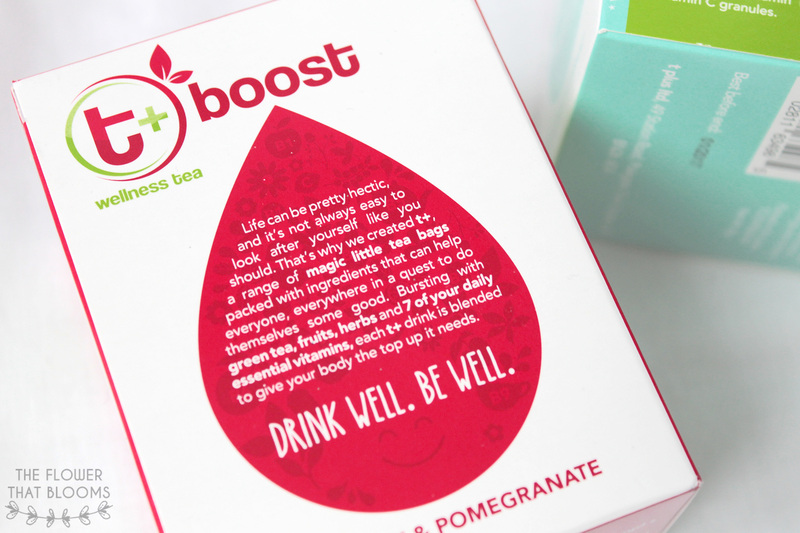 As we have been tired from working a lot over the Christmas period, we decided it’d be a good idea to give ourselves a bit of a pick-me-up and try the Boost tea. As it is raspberry and pomegranate flavour we also felt that it would taste yummy which obviously appealed to us! The taste is quite distinct and although it is quite fruity it isn’t overpowering. After drinking this tea we noticed we felt a bit more energised! Let’s face it we all over indulged over the Christmas period and by January it’s time for a little bit of a detox, hence why we chose this tea! The Detox tea helps you to feel refreshed and a bit healthier. Again it has a unique taste, although we have to say we aren’t as keen as we couldn’t taste the apple in this as much as the blackcurrant. The boxes are £2.67 each which we think is pretty reasonable! Some of the other teas available on their website include t+ Multi Vitamin (lemon & peach) and t+ Immunity (Orange & Blueberry). One box of the tea comes with 15 tea bags and they also do bundles containing four different boxes of tea in each. Although we think we would prefer the teas if they tasted a lot stronger, we would recommend trying them out whether you’re a big tea lover or just somebody who wants to try a healthy, refreshing drink! We’d like to say thank you to Jade and the guys at T Plus for giving us the opportunity to try their teas! *This post is a collaboration with t+ Drinks and all opinions are ours. I’m always looking try new teas that I think I would like (being an avid coffee drinker, sometimes I want a nice warm drink at night that won’t keep me up), and this might be it! Great review! Glad you found this helpful! Hope you enjoy it if you try it!! Lovely photos girls! I just got asked to be sent some tea by another company, so I’m keen on trialling them out. I never specifically go for fruity flavoured teas, I’m more of a nutty and syrupy tea drinker. Anyway totally popping over to bloglovin’ to give you a follow! Keep up the good posts! They look lovely, love the idea of detox tea!